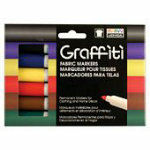 Graffitti Fabric Marker Primary 6 Pen Set includes: black, red, blue, green, yellow, brown. Odorless, water resisant, pigmented ink. Dries instantly with no steaming or ironing needed. Writes on most surfaces, especially cotton. Acid free and nontoxic.